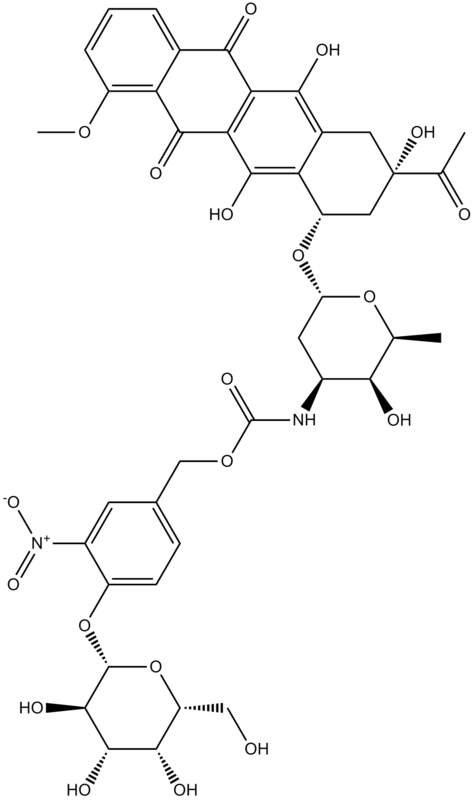 Description Daun02 is an inhibitor of cell viability with IC50 values of 1.5 μM, 3.5 μM and 0.5 μM, respectively in Panc02, MCF-7 and T47-D cell lines. The prodrug Daun02 was converted to daunomycin by the β-galactosidase. It inhibited the cell viability with EC50 values of 1.5, 3.5, 0.5, 5.0, 5.5, 5.0 for Panc02, MCF-7, T47-D, PC3, DU145 and LNCap tumor cells, respectively. None of the tumors responded to treatment with intraperitoneal Daun02. The dose for Daun02 was the highest tested due to the limited water solubilityof the compound. At this dose, the animals did not appear to experience anytoxicityas evidenced bynormal physical and behavioral characteristics and continued weight gain. It may be due to the less distribution and the poor penetrability of Daun02 across cell membranes. Daun02 is an inhibitor of cell viability with IC50 values of 1.5μM, 3.5μM and 0.5μM, respectively in Panc02, MCF-7 and T47-D cell lines . Daun02, an anthracycline derivative, is a substrate of β-galactosidase. β-galactosidase catalyses Daun02 into daunomycin, which causes apoptotic cell death and blockade of voltagedependent calcium channels. Daun02 has been used in the study of suicide gene therapy which has thepotential to increase the selective toxicityof conventional antitumor agents. In this study, Daun02 is shown to suppress the viability of several β-gal gene transduced tumor celllinesin vitro. However, none of thetumors responded to treatment withDaun02in vivo. 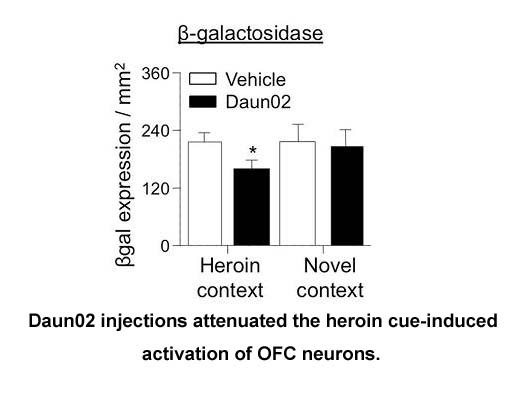 This mayhave been due tothe limited aqueous solubilityof the agent.Daun02 is also used to study activated neuronal ensembles in models of conditioned drug effects and relapse. The method is called Daun02 inactivation method. 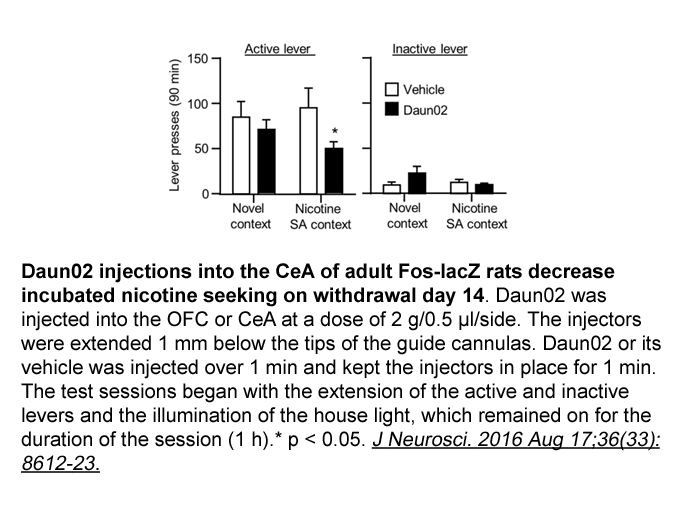 In the Fos–lacZ transgenic rats, the previously drug activated neurons can be inactivated through injection of the prodrug Daun02 [1,2]. 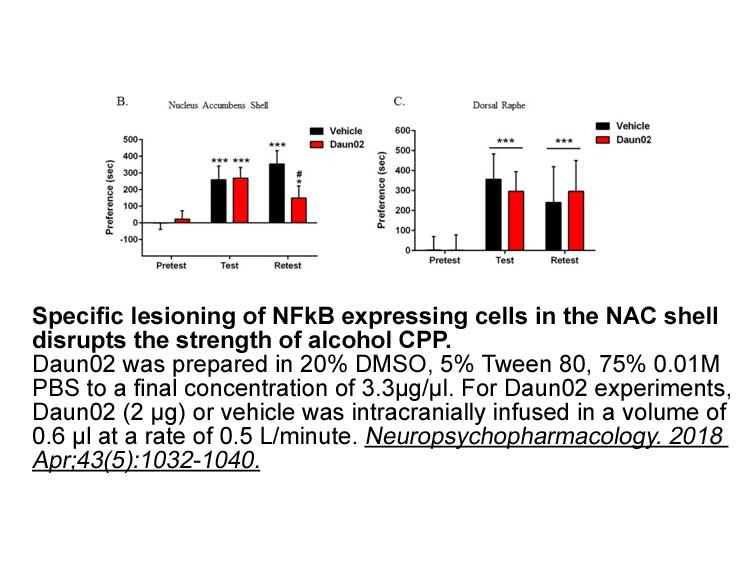 Carl R. Lupica, YavinShaham and Bruce T. Hope.New technologies for examining the role of neuronal ensembles in drug addiction and fear.Nature Reviews/Neuroscience. 2013, 14: 743-754.